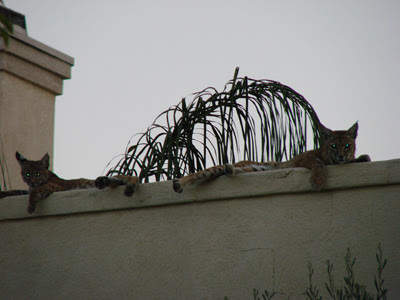 Above: A family of bobcats has taken over a house in Southern California that was abandoned because of the foreclosure crisis. A part of the Indian Ocean the size of Connecticut has been glowing in the dark for several nights in a row. Though the glow has been described in books such as "20,000 Leagues Under the Sea," this is the first time the phenomenon (known as a "milky sea") has been captured on satellite. In the great state of North Carolina, a man and his granddaughter recently caught a record-sized catfish using only a pink plastic Barbie rod and reel. Who needs a compass? All you need to know where you're going is . . . a cow. Studies have shown that 60 to 70% of the time, cows graze in a north/south pattern. The price of rat meat has skyrocketed in Cambodia. Planning any home renovations? 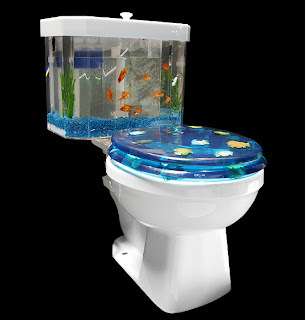 If so, I recommend installing a "Fish 'n Flush," the world's #1 toilet aquarium (shown below). **First comment** I love the toilet!! Hi everyone! This is Sekrit7, I just got bored of my old name and decided to change it! I do that a lot.... Also, please check out my new blog! I promise not to abandon it like before! Poor fish. Must be smelly in there. Both my fish have ich. Ick. that toilet sure does look cool, but what if the fish accidently got flushed?!? in S.C i used to catch 3 foot gar on a kiddie pole. love the toilet! !